← What tea is this? is the Mengku Yuanyexiang (YYX), thick paper, I believe. A friend of mine gave me half a cake, which by today’s price is probably worth a few million. 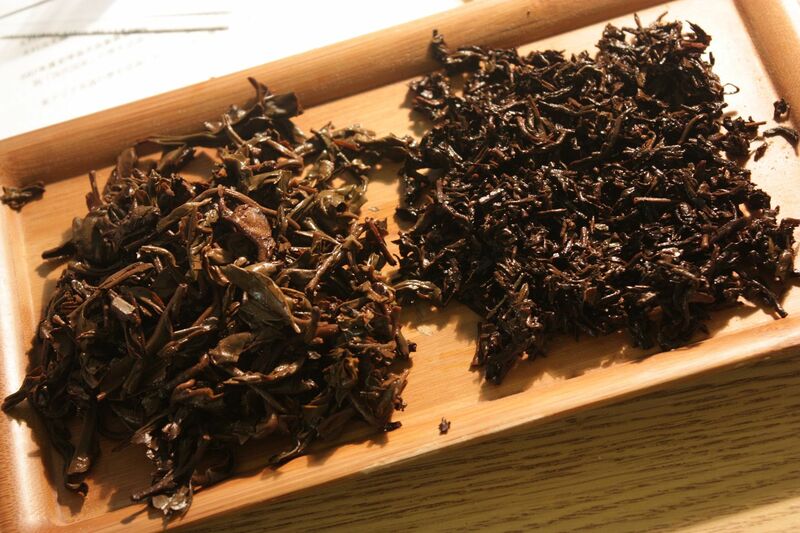 YYX leaves on the left, cheap, cheap Chinatown cooked puerh on the right. The reason I thought it was interesting was because within that tea, you can taste, very distinctly, the wet storage that went on. It has that musty smell and taste that’s only attainable through that kind of storage. Some people hate it, but others think that true puerh should only taste like that. The difference between it and the thin paper, supposedly dry stored (in actuality less-wet stored), is not all that great. I find the thin paper, which I tried multiple times and I own a few of, to be harsher. It’s not the best tea — it’s merely good. The problem with this kind of tea is that it’s very much a “brand name” tea. It’s famous because of various types of promotional things that have been done to it — magazines, word of mouth, etc. Hou De sold out both pretty much the instant he put them up. It’s really quite amazing. The fact is though that teas like this are not that great — you can probably find, after some searching, some tea on taobao that costs only a fraction but taste just as good. However, what’s missing is the “celebrity” factor. When you drink the YYX you know it’s good — because so and so expert said so. When you drink this other stuff that costs only a fraction, you don’t know that it’s good…. because, well, nobody told you that. What’s in the price is that stamp of approval. As we all know, such stamps of approval tend to be abused, because there’s real money to be made there. That’s why I normally don’t go for teas like this, and only drink things that I myself find pleasing. I also tend not to talk about them all that much, male urine aside. I know what I like, which may not be what you like. What’s important is developing your own sense of what you find to be good taste, rather than to follow what other teach you to be great. Although I will agree that we should drink for our own pleasure, the thing is, that pleasure is about perception. And unfortunately, price often alters perception. Is a car bought end of season for a steep discount any different than the same car bought off the auto show floor? No… but the pride/moxy/etc of people that buy them at the auto show does seem to give some people alot of happiness. We see that effect everywhere there’s something to buy. In my neighbourhood, there’s several groceries, one of which is “high end”. It really just means you’re paying 15-20% more for the same products, but the people that shop there genuinely seem to be happy about shopping there, where those that are shopping at the “regular” grocery often just seem to be drudging a chore and want to get home. There’s a similar effect at WholeFoods. Now.. on the one hand, we can say, hey, those idiots are just paying too much. On the other though, maybe it is worth the extra 15% if you feel good about doing something mundane like buying groceries. Whether it’s Tea or Groceries, in the end it all winds up in the toilet. One of the best sentences written on tea in some time. Seeing and drinking tea with other experienced tea drinkers has also helped me immensely.